In the story, it is Joan who prolongs the name “with a certain tone of celebration”. But it’s easy to imagine that it is actually Alice Munro who is savouring every syllable as she draws it out in ink. You can imagine her there, à la Winslet and DiCaprio, at the bow. No, not Penelope there, but Juliet. Once part of a pair, now a singleton, with her Romeo lost at sea. The alignment of a “Juliet” with a “Penelope” in a story cycle whose first story features a heroine with an affinity for the Classics? Allusions abound for readers of “Chance”, “Soon” and “Silence”. In Rainbow Rowell’s Eleanor and Park, a character explains the endurance of Shakespeare’s “Romeo and Juliet” by saying that people want to remember what it was like to be young and in love. Alice Munro chooses her characters’ names deliberately and carefully. But here it feels as though readers are meant to remember what it was like to be once-young and no-longer-sure-it-was-love-anyway. Readers’ expectations of a “Juliet” are challenged initially in “Chance” (although Juliet does act impulsively in that story, seeking out Eric in his home north of Vancouver). And just as Romeo had been smitten by another young girl, Eric’s affections have been previously engaged, not only by his wife, but by another woman (whom readers become acquainted with in “Silence”). But Juliet is still drawn to him, despite some off-putting moments and realizations. Even while she acknowledges some imperfections in the situation. Eric’s independence (disinterest? unavailability? neglect?) appeals to Juliet strongly and immediately, as much as if Eric had been a Montague. From the man on the train in “Chance” to men that she meets years later, Juliet — who is desirable in Shakespeare’s play for her very Juliet-ness — wants to be wanted, but her conviction is muddled when the idea of wanting mingles with the idea of needing. What is most remarkable are the differences between the classical heroines and their roles and actions in this trio of stories. For instance, Penelope is not she-who-waits as she was in the traditional myths. Juliet conjures up a variety of scenarios for her daughter, who it turns out, has not been charmed by Circe or barricaded in a cave by a shepherd. Nor has she disappeared underground, like another mythic figure whose allusions have fleetingly appeared in other Munro stories. No, Juliet has set up house off the beaten path. In a small community perhaps much like the one which Penelope’s parents called home, though in northern Canada, not southern. Juliet does not comfortably inhabit her role in this story, whether literally or figuratively detached. After Eric’s death, she becomes even more keenly aware of a sense of distance between her own experience of her life and the events unfolding around her which comprise that life. It is interesting to consider the women who inhabit the margins of this pageant. And, quite possibly, given Eric’s propensity to wander (and, seemingly, to take up with other women as freely as Odysseus did on his travels), there is some truth to Juliet’s sense of remove from this relationship. In “Silence”, Alice Munro offers readers something like Margaret Atwood’s Penelopiad, a Penelope with wanderlust and a living, breathing, aging Juliet. Versions of versions, stories within stories: “Silence” ends with an homage to “Chance” and readers can imagine rereading many times to unearth new layers of understanding. Do you have a favourite amongst this cycle of stories? If you could request a fourth, what would you like (or expect) it to contain? Do characters and situations in these stories recall other Munro stories as you read? If this story was a reread for you, what (if anything) did you remember of your earlier reading? Finally, if you haven’t read this story, is there another collection of stories in your stack currently? 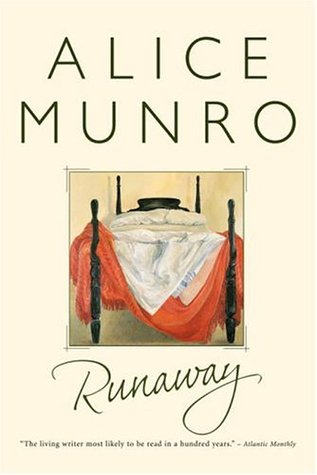 Note: This is part of a series of posts on Alice Munro’s stories in Runaway as I read through her work-to-date. She is one of my MRE authors and this is the fourth story in this collection. Please feel free to check the schedule and join in, for the series, or for a single story. Next week, “Passion”. Note: There are spoilers in the comments below. That’s a lovely fourth story. I would like to see her content, perhaps in some of the ways that you’ve described, but I would also like to see more of her backstory. I’m sure she gave up some things for that small-town life as a mother, and even if Penelope doesn’t want to know that history, I bet it’s worth hearing. If I could request a fourth story I think I would like to include Juliet and the idea at the end of Silence that “She hopes as people hope who know better hope for undeserved blessings, spontaneous remissions, things of that sort.” Juliet would be living in a retirement community or a senior’s home. Or possibly, she is living with a retired professor of classical studies and finally comfortable in her own skin. Perhaps it would include a contact with one of Penelope’s five children, possibly named Sara, who has published a novel based on a classical heroine. These stories were rereads for me but I had not remembered very much and am grateful for your inspiration to reread.